The Taste NY Market inside the Western New York Welcome Center. One of 11 welcome centers located across New York State, the Western New York Welcome Center features an iconic “Prairie style” design inspired by the legendary architect Frank Lloyd Wright. The location features interactive video displays that prominently highlight the region’s history and tourism attractions across Western New York. The new Welcome Center also includes a Taste NY Market offering an array of New York grown products. The Taste NY Market showcases a broad selection of freshly made breakfast and lunch items, including soups, salads, sandwiches and desserts using ingredients sourced from Western New York growers and producers. 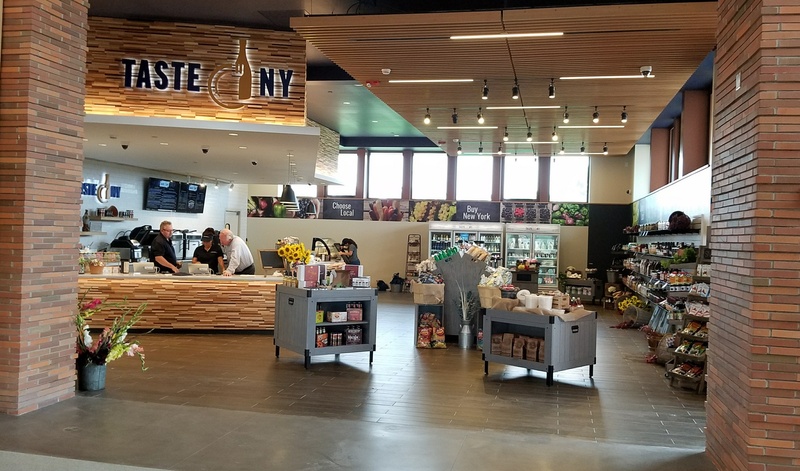 It also offers grab-and-go snacks, craft beverages and specialty local items for sale, providing an opportunity for local producers to market their products and to connect New York's residents and visitors to the state's food and beverage producers. Open 24 hours a day, the Welcome Center features a community room, an I LOVE NY "selfie wall," an historic artifacts display, a floor map of regional attractions, vending machines and café style seating with tables that will provide an enhanced visitor experience. The grounds surrounding the Welcome Center include a children's play area with a Great Lakes shipwreck theme, an I LOVE NY sculpture, electric vehicle charging stations, a motorcycle shelter, pet comfort area, and parking spaces for cars, buses/RVs, and trucks. The Western New York Welcome Center opened in August 2018. The Frank Lloyd Wright-inspired Welcome Center represents the gateway to world-class destinations and historic sites in the Western New York region. Approximately 23.7 million motorists travel past this location each year. Visitors who stop at the Welcome Center for information are more likely to explore alternative attractions and destinations, and therefore spend more, stay in the region longer, and use the information for future trips. Located in the Town of Grand Island and between the cities of Buffalo and Niagara Falls, the Western New York Welcome Center is accessible from the Niagara Thruway (I-190) exit 19 (Whitehaven Road) via Alvin Road. The Buffalo Billion committed $20 million toward the center. The current menu and list of products available can be found here. The Taste NY Market is open 7 a.m. to 7 p.m. seven days a week.